This bottle is a gift from my dear friend Louisa who is currently staying in South Africa in the middle of Stellenbosch wine country. When she told me on the phone that she had a great bottle of Cabernet Sauvignon Blanc for me I thought she was mistaken and surely meant Sauvignon Blanc. So now I have the bottle and this is one of the many moments in the life of a wine-lover when he realizes he doesn’t know a thing about wine. 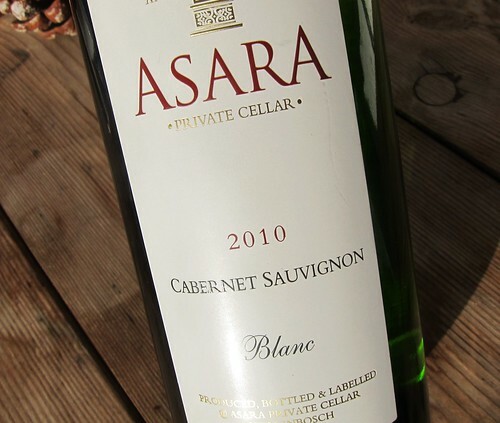 Did anyone ever have a White Cabernet? The winery told my friend that it’s a typical wine for the region. Anyhow, this will be a first timer for me, and I’ll report upon opening it. Thanks again, Louisa!